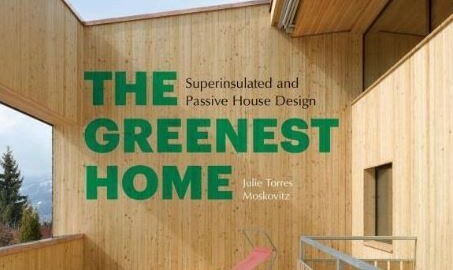 Julie Torres Moskovitz’s book showcases eighteen recent Passive House projects from around the world, including the first certified Passive House retrofit in Connecticut. Duncan Architect was the Passive House consultant for this project. If I ran the world—or at least the planning departments of the world—every house would be a Passive House (not to mention every school, hospital, office building). Each house in this inspiring book is beautiful on the outside and brilliant within. Each merges bold aesthetics with common principles: they’re well insulated, high performing, and ridiculously efficient in their resource usage. The real mystery is why Passive House principles aren’t standard best practice yet. They will be. They must. Before and after shots of the Passive House retrofit project in Westport, Connecticut, an hour or so northeast of New York City. Duncan Architect was the Certified Passive House Designer working with architect Ken Levenson to create a comfortable, healthy, energy-efficient building. Treehugger recently profiled our project and the owner/builder Doug Mcdonald. Increasing the occupants’ comfort and ability to do their job by reducing noise and drafts while also reducing utility bills. A preliminary blower door test revealed major air leaks in the existing masonry. These gaps were not obvious from a visual inspection and would have created huge problems with water leaks, uncomfortable drafts, noise transfer, and a high risk of condensation and mold growth. Fortunately we discovered them before the drywall went up so that the contractors could patch them. After the test, the contractor installed regular fans in the windows to create a pressure differential to reveal where the air leaks were. Sophisticated equipment is required to measure the rate of air leakage but not to simply find the leaks. The next step after installing the mineral wool installation is to put up a vapor retarder—on the warm side—that also acts as the primary air barrier. Intello, available from 475 High Performance Building Supply in Brooklyn, is a “smart” vapor retarder that prevents moisture transfer into the wall assembly while allowing it to dry out if it becomes accidentally saturated. After the air barrier is complete, but before the drywall is up, we will conduct another blower door test to make sure that the building’s airtightness is below the Passive House retrofit standard of 1 ACH50. Finally we will install a service cavity of 1-5/8″ furring to protect the airtight membrane. Below is a view of the building from the F train platfrom with the old plumbing supply sign painted on the brick and One World Trade Center in the background. and check out video of a successful blower door test from our friends at Dwell Development in Seattle. donuts courtesy of Zola Windows. Gregory Duncan Architect is the acoustical and Passive House consultant on this project. Haus 96, the first multifamily Passive House retrofit building in Brooklyn, will be open for guided tours on Saturday, November 10, 2012. This project proves that historic preservation, comfort, healthy indoor air, and dramatically reduced energy costs are compatible. See New York Passive House’s listing of upcoming tours for more information. On Sunday, November 11, 2012, there will be an opportunity for a guided tour of the Bauhaus Residence in Westport, Connecticut. Designed in 1934 by a disciple of Frank Lloyd Wright, the home was in dire need of renovation in 2011. The cast-in-place concrete structure is a striking example of the International Style in rural New England. Unfortunately the original concrete walls required a tremendous amount of energy to keep warm in the winter. In order to increase the energy efficiency and comfort of the house, architect Ken Levenson clad the entire building in ten inches of Foamglas insulation. With a passive solar hot water heating system, triple-glazed European windows, and an energy recovery ventilator, the award-winning project is going for Passive House retrofit (EnerPHit) certification. Gregory Duncan Architect performed the energy modeling and thermal bridge calculations required for certification.